The Conservative Party owes £16m to 13 wealthy supporters who helped bankroll its election campaign, it has revealed. But the identity of backers it has repaid £5m - including a number of foreign nationals - will remain secret, prompting criticism from Labour. Tory chairman Francis Maude said he "regretted" accepting loans from abroad but insisted it had not broken the law. The party owes a total of £37m - including loans from local Tory associations and a bank loan. Labour published its own list of lenders - totalling nearly £14m - nearly two weeks ago, following claims - denied by Tony Blair - it was selling peerages. But the Tories had argued it would not have been fair to name people who had lent it cash without their permission. Mr Maude said the party had spent the past few days persuading lenders to go public. But he said it had also had to pay back £5m to lenders who wanted to remain anonymous including a number of foreign nationals, using cash from loans, donations and "cash flow". Donations from foreign nationals are illegal under electoral law - but not loans. But following Labour claims the Tories had broken the spirit of the regulations, Mr Maude said he regretted the fact that party had received foreign loans. "These loans represent a very small part of our financial backing - I wish we hadn't done so but we have and we have now set the record clear we have repaid those loans and the matter is perfectly clear," Mr Maude told BBC Radio Five Live. "It would clearly have been better if we hadn't as things turn out but that's the way it is." But he insisted the Tories had done nothing wrong and that Labour had been "much less transparent about this whole process than we have". The party's biggest individual lenders are ex-party treasurer Lord Ashcroft, with £3.6m, and Lord Laidlaw with £3.5m. Mr Maude told Channel 4 News none of those whose names were being kept secret had been nominated for peerages. He said "some new loans" had been taken out to pay off the £5m - with the rest raised through donations and cash flow. Asked if one of the loans - £2.6m from Swedish sports equipment tycoon Johan Eliasch - was made on Friday, he said: "Yes I think that's right." 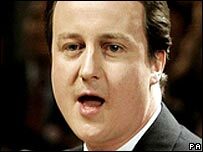 He also said it was "no particular secret" that Lord Ashcroft and Lord laidlaw had increased their loans. In addition, the party borrowed nearly £16m from a bank to buy the freehold on its former headquarters in Smith Square and £4.7m from local Conservative associations. The party said it had no overdraft. The Electoral Commission welcomed the Tories' decision to publish the list - but said it had written to the party asking for more details on the loan terms. Labour chairman Ian McCartney said the Tories still looked like they had "something to hide" by not revealing the identity of their foreign lenders. "We need to know who these people are, where they reside, where they pay tax, how much they lent and on what terms. "It is not up to the Tories to claim that they did not breach the law. That's the job of the Electoral Commission. "By failing to provide these details the Conservatives and David Cameron are fuelling suspicion that they have even more to hide." Tory leader David Cameron is seeking a meeting with Tony Blair to discuss party funding. He also called for a cap on political donations. Meanwhile, a Metropolitan Police investigation into "cash for peerages" allegations - which initially focused on Labour - has been widened into a cross-party probe. The force refused to say which parties were being investigated but it has emerged that Labour MP Rosemary McKenna has asked it to look at the Tories too. It is understood Scotland Yard's specialised crime directorate is also looking at claims about at least one other party.